ICRP, 2009. Application of the Commission's Recommendations to the Protection of People Living in Long-term Contaminated Areas After a Nuclear Accident or a Radiation Emergency. 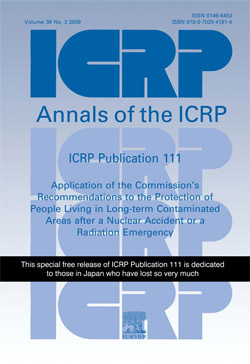 ICRP Publication 111. Ann. ICRP 39 (3). Abstract - In this report, the Commission provides guidance for the protection of people living in long-term contaminated areas resulting from either a nuclear accident or a radiation emergency. The report considers the effects of such events on the affected population. This includes the pathways of human exposure, the types of exposed populations, and the characteristics of exposures. Although the focus is on radiation protection considerations, the report also recognises the complexity of post-accident situations, which cannot be managed without addressing all the affected domains of daily life, i.e. environmental, health, economic, social, psychological, cultural, ethical, political, etc. The report explains how the 2007 Recommendations apply to this type of existing exposure situation, including consideration of the justification and optimisation of protection strategies, and the introduction and application of a reference level to drive the optimisation process. The report also considers practical aspects of the implementation of protection strategies, both by authorities and the affected population. It emphasises the effectiveness of directly involving the affected population and local professionals in the management of the situation, and the responsibility of authorities at both national and local levels to create the conditions and provide the means favouring the involvement and empowerment of the population. The role of radiation monitoring, health surveillance, and the management of contaminated foodstuffs and other commodities is described in this perspective. The Annex summarises past experience of long term contaminated areas resulting from radiation emergencies and nuclear accidents, including radiological criteria followed in carrying out remediation measures.